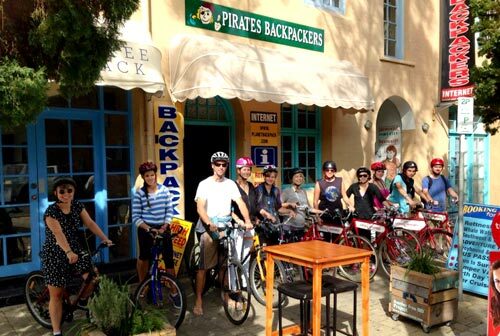 Pirates Backpackers is Fremantle’s only small hostel, more often referred to as a shared house. Pirates Backpackers is secure & cozy, situated right in the heart of vibrant Fremantle, with the famous Fremantle markets at one end of our street and the Esplanade, Fishing Boat Harbour and the Beach at the other. Pirates is heavily focused on Beach & outdoor activities, including Surfing, Stand up Paddle Boarding, Beach Volleyball, Sunset Yoga , Snorkelling trips, Bush walks, Boating, Exercise Sessions, Sightseeing Excursions & loads more! We also have the best open courtyard of all that everyone loves! Pirates is run by the energetic owner Vaughan, who has been at the helm for 11 years! Along with Tasha & a small crew of brilliant staff we will do our utmost best to ensure you a sensational stay. What is Pirates all about? It’s about giving people a real and unique experience of Perth, Western Australia from a homely environment. It’s about introducing people to our sensational lifestyle complimented by great beaches, brilliant weather and beautiful countryside. Pirates is about making each guest a member of the family and helping people form great friendships. It’s about fun, spontaneity and belonging. It’s about activities from surfing, boating and diving, to beach volleyball, camping and an array of various outings. Pirates is about each guest being important. It’s about helping each person on their life journey of discovery. Enjoy! Pirates Backpackers is loving the start of Spring! The Owner and staff who know your name ! …and the coziness you can only find in a small homely hostel like Pirates! – the only small hostel in Freo! Check out our Events page for up to date activities and join us on Facebook (Piratesbackpackers Fremanle)… Yeahh Babyyy! !